Is Facebook sexist? and Go Bonnies! Hooray! The Lady Bonnies made it to the Sweet 16! St. Bonaventure (that’s my school) beat Marist 66-63 yesterday and they’re now moving on to play Notre Dame. I went to the Rathskeller (on-campus bar) last night to watch the game with other students and faculty, and there were a lot of media there. As we watched the big-screen, cameras from different TV stations watched us. It’s really fun to watch all the coverage we’re getting. Here’s a video on student reactions from YNN Buffalo. 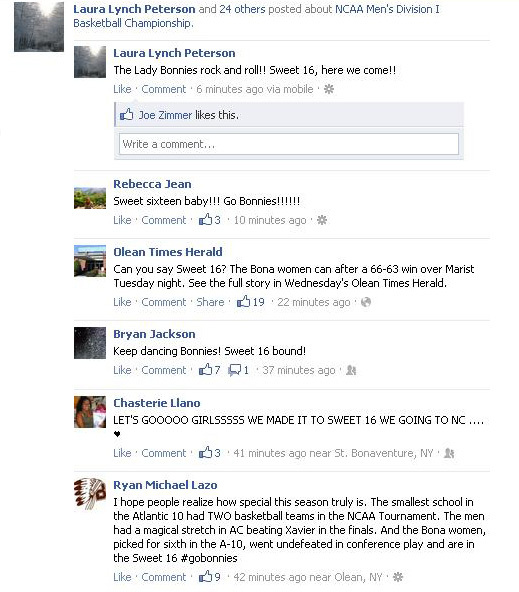 Bonnies talk takes over my Facebook and Twitter newsfeeds before, during and after games — so pretty much all the time. “Bonnies” has been a trending topic a few times within the season. I have no complaints. Look at all my fabulous friends celebrating on the internet! But wait, what topic does Facebook group this conversation under? NCAA Men’s Division I Basketball Tournament? Doesn’t Facebook know that the men aren’t in the tournament anymore (sadly)? I suppose I don’t care that much, but I reported the inappropriate grouping to Facebook. I posted the above photo on my timeline, and it received 23 likes. Other people think similarly. It’s just ironic, and it just adds to the fact that the women don’t get as much credit and attention than the men. One of my friends commented on the photo and said that Facebook is sexist. I wonder if there are any other examples. Can you think of one? It’s about time the women’s team gets some recognition! Let’s hope Facebook catches up with the rest of us. I think that maybe Facebook is not sexist persay, however society still remains at least a little bit sexist. Just the fact that the automatic thought process entails assuming that it is the men’s team instead of the women’s..why wouldn’t your first thought just be, “Oh, the Bonnies, that’s awesome. I wonder if they mean the men or women’s team?” But that’s not the automatic thought process of most. I’m just so tired of these restrictive gender roles. Boys play sports and get dirty while girls shop and get their nails done. It’s just ridiculous. Thanks for the blog, Em! I totally agree!